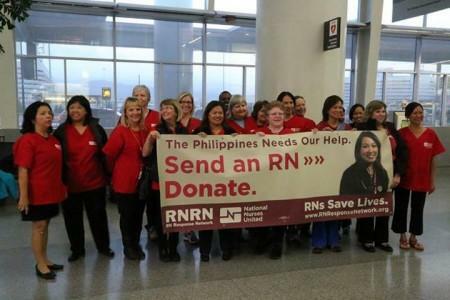 As the heart wrenching images crossed across our screens from the Philippines, the largest U.S. organization of nurses, National Nurses United, was getting in motion as well. Our Registered Nurse Response Network put out a call. The response was overwhelming. In little more than one week, nearly 3,000 RNs from all 50 states and even 19 countries had signed up to volunteer to provide hands-on disaster relief to those in the path of the super storm. Within a week, our first delegation, an advance team sent to see where our volunteers would be most effective and provide some direct care themselves, was already on the ground. Our second delegation is now engaged as well, setting up camp in Roxas City on the northern end of Panay, an island slammed by Typhoon Haiyan/Yolanda. vaccinations, antibiotics and other medications, and other general basic medical care. We've also been greatly facilitated by the birth of an international movement of RNs and healthcare workers, Global Nurses United, earlier this year. 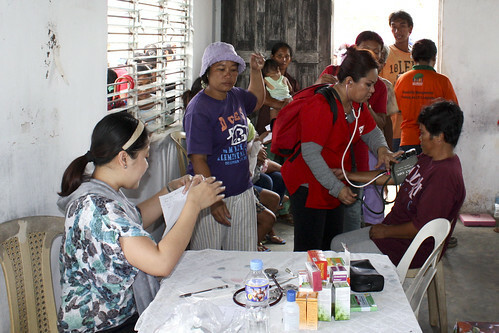 Our GNU sister union, the Philippines Alliance of Health Workers, has worked with us daily, in scouting locations and working shoulder to shoulder in the clinics. Other GNU partner unions are also preparing to send RNs to work with our deployment. The need is obviously great. At least 4,400 died, with thousands more injured and missing. 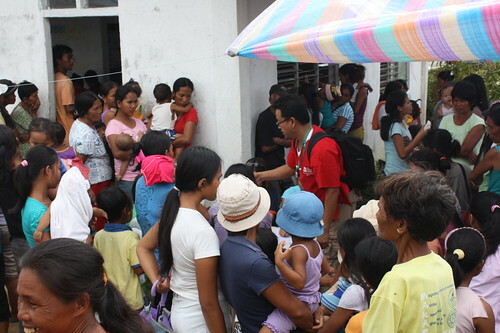 According to the Philippine disaster council, about 3 million people have been displaced with 400,000 living in nearly 2,000 evacuation centers. "What we've seen is total devastation," said RN Joseph Catindig, a member of our first deployment team. "People have lost their homes, lost their livelihood, lost their animals that helped with their livelihood. They only ask for a little. They need medical care. They lack medicine, lack nurses, lack doctors. In each area we go to this is their plea, to help." At another rural site near Sara on Panay, RN Marti Smith describes how the economic livelihood for many, based on fishing and agriculture, has also been demolished. "The boats are destroyed. The agriculture they depend on, coconut, bananas, rice, coffee, is devastated. Banana and coconut trees are broken in half and gone. Coffee trees are gone too. Hills are deforested, which will cause big environmental problems and landslides. These peoples' livelihood is destroyed. They've lost not only their homes, but also their ability to feed their families." It's stories like this that have prompted our organization and nurses who work with us to act - even while so many who should be doing more stand on the sidelines. It is that need to act that sparked the creation of RNRN nearly a decade ago, with multiple RNRN deployments, first following a cataclysmic South Asia tsunami, then the disgraceful governmental indifference following Hurricane Katrina. And on and on, through the earthquake in Haiti, Hurricane Sandy, and other calamities. If it seems that RNRN has been on call a lot, and that disaster is one of the few growth industries in troubled global economies, that's not an illusion. Poverty and economic inequality of course contribute greatly to a disproportionate impact among those slammed by the disasters. But the biggest culprit is climate change. Meteorologists and NASA scientists have called Haiyan/Yolanda the most destructive and powerful tropical cyclone ever to hit landfall. One reason, as noted by U.S. News and World Report, sub-surface ocean waters have been recorded at up to 9 degrees Fahrenheit above average fueling the strength and size of the storm. Hurricane Sandy, which ravaged the U.S. East Coast a year ago, which was also spurred by warmer ocean waters, record droughts that debilitate arable lands and prompt mass population migrations, and many other not-so-natural disasters are similar reminders of our failure to adequately act. Coincidentally, Haiyan/Yolanda hit during a meeting of the United Nations Framework Convention on Climate Change in Warsaw. The Philippine lead climate negotiator Yeb Sano, called the typhoon a "sobering reminder to the international community that we cannot afford to procrastinate on climate action and that Warsaw must muster the political will to address climate change." But as representatives from the wealthiest nations, including the U.S. continued to try to shift the responsibility to poorer nations, even though our country has long been one of the principal producers of the emissions that are a major factor in climate change, a group of 133 developing nations staged a walk out. UN Secretary-General Ban Ki-moon said that Typhoon Haiyan puts "an anguished human face" on climate change and he hopes that "all tragic devastation would really give us a wake-up call." In case anyone still wonders why NNU and so many others also continue to protest the pipeline, which would further accelerate climate change, look at the faces in the Philippines today. "So many don't have any shelter, they have lost everything, clothing, belonging," said Michelle Vo, RN member of the first team. "Many are sleeping on makeshift tents in the rain. We see people who are dehydrated, malnourished, kids sick with fever. They need nurses, equipment and supplies." "Being able to help people in need is why I went into nursing," says University of Michigan RN Tim Launius, a member of the second delegation who also who helped provide medical relief to victims in Texas after Hurricane Katrina. 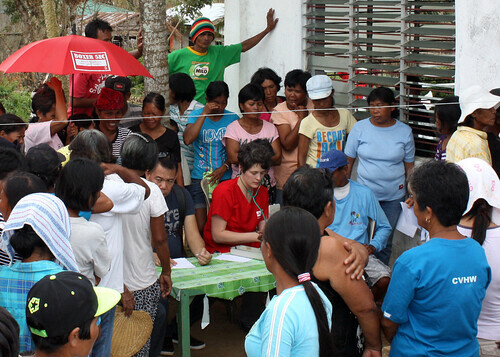 "As an experienced nurse, I have skills and training that can be put to good use." The volunteers not only provide medical support and comfort, they come back too, often moved into the additional activists our we so desperately need. "You think you went there to change peoples lives, but you are the one who is going to be transformed. You will never see things the same way again," Catindig says. This is the experience of almost all of the nurses that go on these deployments. They come back changed. It is moving and profound. We are very luck to have people like these in our world.